Entertainment is a necessity for every human being. We, especially after the grueling work hours, or long hours of study in the lecture hall. Sport is a great choice for us to release stress and recharge for the next working time. However, not everyone has much time to play sports, so the sport theme games are also developed very strongly, to meet the needs of human entertainment. 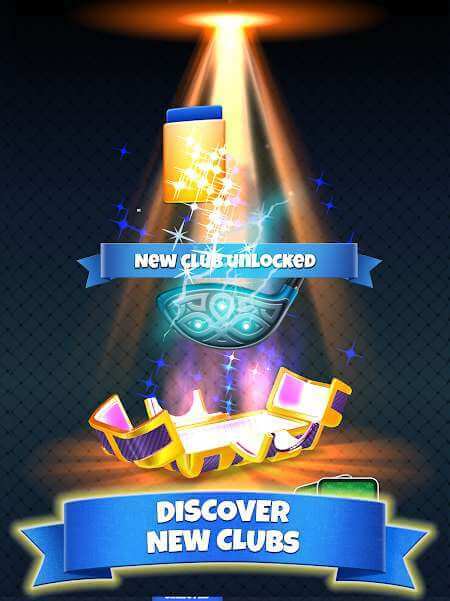 Golf Clash will be the game that I introduce to you in this article. This is a simulation game of the sport that we usually consider to be for the upper classes and now you can play golf without going any further. In this game, you will be a professional golfer. The game offers a variety of game modes, suited to your abilities so you can choose as you wish. There are two main modes are single player and team. In single-player mode, you need to play golf in a hole placed on the grass. In the first round, you will play golf towards the hole, so as for close as possible. In the second, you hit the ball in the position you just reached in the hole. If both times you slip, you fail. In the other mode, you will pair with other players at the same level. Then the two will alternately hit a flagged position to score. After a certain number of turns, players with higher scores will win. However, in this double mode, you and your opponent will have to bet some money, after the game, who wins will get all the money, plus the bonus from the game again. On how to hit the ball, agility and accuracy are the two prerequisites for winning the game. At each turn, a continuous red line moves from left to right, then right to the left. You need to determine when this line is pointing toward the target and quickly tap the screen to make a shot. When the arrow points to the correct destination, the higher the score is. 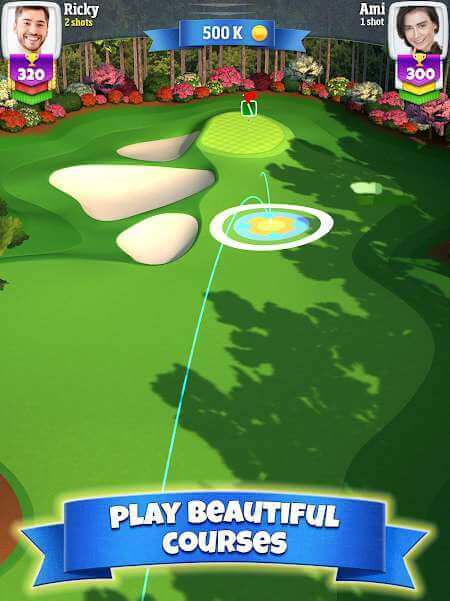 Golf Clash is designed with 3D graphics, giving us a large, silky, green environment. The quality of the graphics is quite high, so it creates a sense of well-being, feeling like it is standing on a real golf course, and enjoying the morning sunshine, under the blue sky. At the same time, the game also has a lot of beautiful scenes and angles, helping the players feel the movement of the golf ball has just emitted, thus drawing experience for the next hit is perfect. 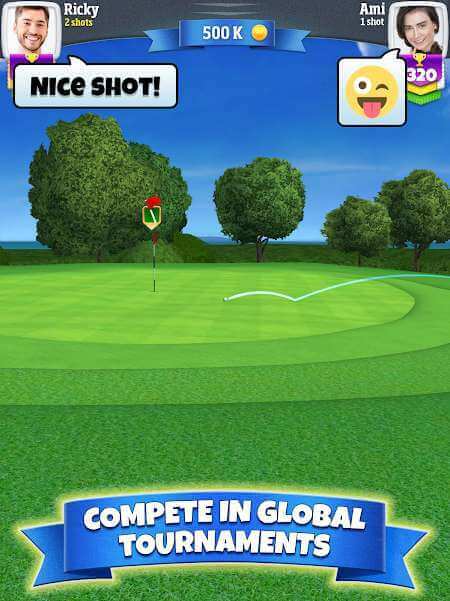 Overall Golf Clash is an attractive game that you should try at least once. 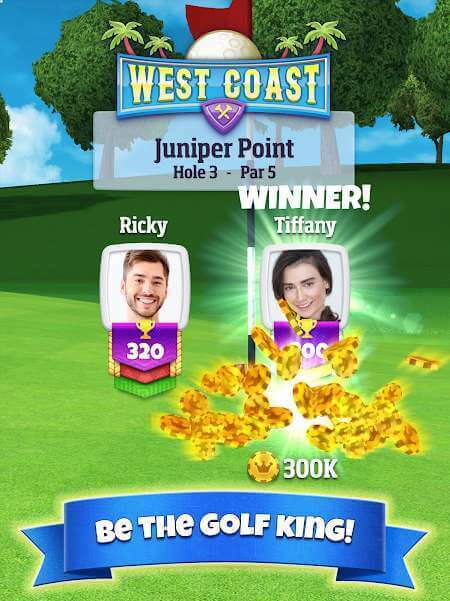 From now on, if you want to play golf, you can launch this game, then invite your friends to join the game without going to the golf course and pay the expensive ticket again. In particular, this game is quite a community; you can link to your Facebook account, chat with other players and even poke your Facebook friends. Download this game and have fun with your friends.